As the Indian Navy conducts an official inquiry, unofficial versions in Russia of the tragedy vary wildly from negligent handling of arms to a hydrogen leak. In the wake of an explosion sinking the INS Sindhurakshak on August 14 in the Mumbai naval dockyard, Russian analysts have been discussing the various possible scenarios that could have led to the tragedy that claimed the lives of 3 naval officers and 15 sailors. Russian analysts have stressed on the fact that no claims were filed and no malfunctions were noted at the time the submarine’s bill of delivery to the Indian Navy was signed. The cause of the explosion is yet to be established. According to one theory, a buildup of hydrogen might have occurred during battery charging, which needs to be performed once every few months. 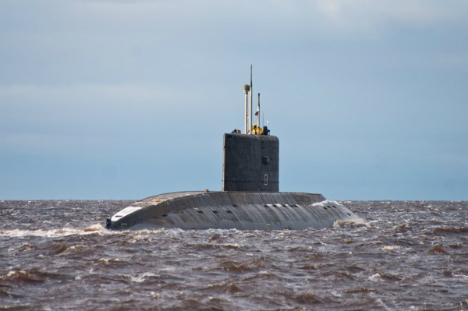 The sub carries around 500 batteries, so this process involves many technical staff, RIA Novosti reported. This theory is supported by the fact that the submarine suffered a fire when it was docked at the port of Visakhapatnam in Eastern India in February 2010, which killed one crewmember and injured two others. An inquiry has revealed that a faulty battery valve leaking hydrogen was to blame. Others believe the explosion had nothing to do with the batteries. Viktor Melnikov, an observer at the Independent Military Review weekly, believes the sub’s arms were at fault. “I don’t think this had anything to do with shipbuilding or repairs. This is most likely a matter of safe handling of onboard weapons. Because this doesn’t seem like an explosion of diesel vapours or a battery.” he told Kommersant FM. The United Shipbuilding Corporation will send its experts to India to assist in investigating the cause of the explosion on the Russian-built submarine. “The corporation has been in touch with the Indian side. They have proposed that more experts be sent to establish the cause,” Ivan Kharchenko, Senior Deputy Chairman of the Military Industrial Commission told Interfax. The Zvyozdochka ship repair centre has also expressed readiness to cooperate fully in finding the causes of the sub’s catastrophe. According to the plant’s press secretary, Nadezhda Scherbinina, “the Severodvinsk shipbuilders took the accident as a personal tragedy,” since the Indian crew members and their families spent more than two years in the White Sea town.